Click if you want to know more about panel meters. The CN9000A digital temperature controllers feature high accuracy and reliability, and the sophisticated PID with approach control for optimal control during start-up and steady-state operation. These units are well suited for a broad range of applications, and are easy to install and operate. The unique, sophisticated autotune algorithm will calculate the optimum PID values, and additionally recommends the best value for cycle time. For most applications, the user need only select the desired input type, simply by using the front pushbuttons. The autotune parameters can be changed by the operator at any time, allowing the operator to fine tune the controller to an individual process. The microprocessor holds all data in non-volatile memory, with the ability to retain data for 10 years with no power. 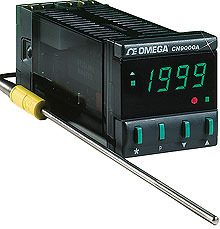 The CN9000A has a large, 3 1/2 digit green LED readout, with auxiliary indicators for each output, and 3 LED’s to indicate deviation from setpoint. Selection of all operational controls is made through the keys on the front panel, with the display prompting the user through each step. After the parameters have been set, they can be locked in, simply by removing a jumper located behind the front bezel. The user can select the control mode and parameters, display resolution (1 or 0.1°), and units (°F/°C). The operator can also utilize the ranging feature, which limits the range in which the setpoint may be chosen, or lock out a user from changing the setpoint. The new single setpoint controller has rear termination. The optional second setpoint and output of the CN9000A model can be set for proportional, on-off or latching limit control, and can be set as either a tracking or non-tracking setpoint. Cycle time, proportional band and on-off deadband are all set independently of the primary setpoint. Noise Suppression RC snubber (2 leads), 110 to 230 Vac. Can be used with any CN9000A controller with mechanical relay output.